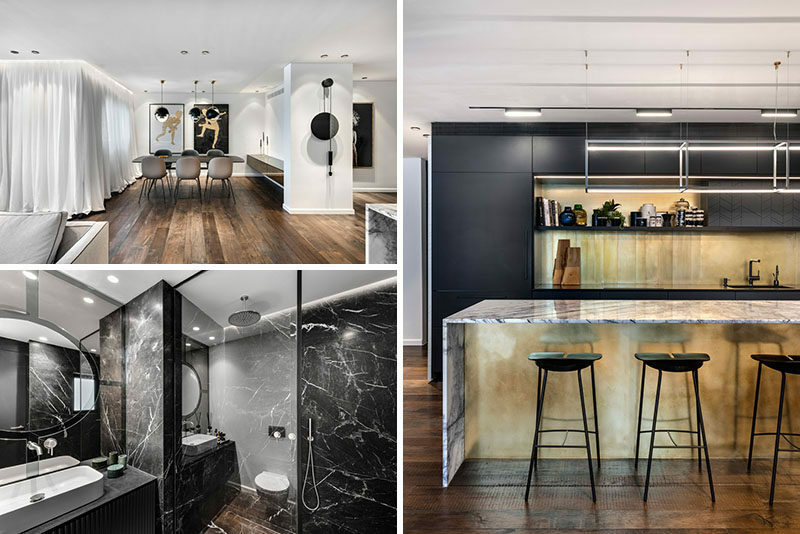 Aviram – Kushmirski Interior Design have recently completed the modern transformation of an apartment in Tel Aviv, Israel. Upon entering the apartment, there’s a small entryway with a highlighted piece of artwork on the wall. 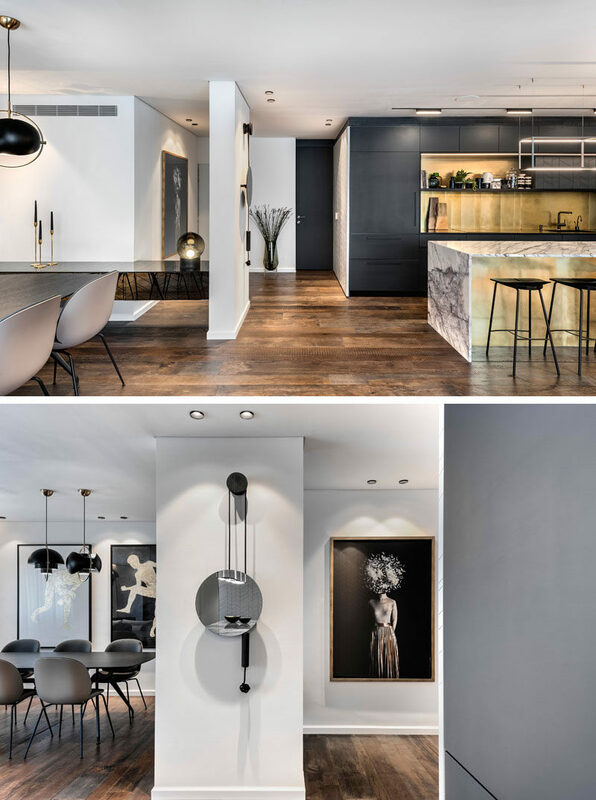 From the entryway, the apartment opens up to an open plan dining room, living room and kitchen. 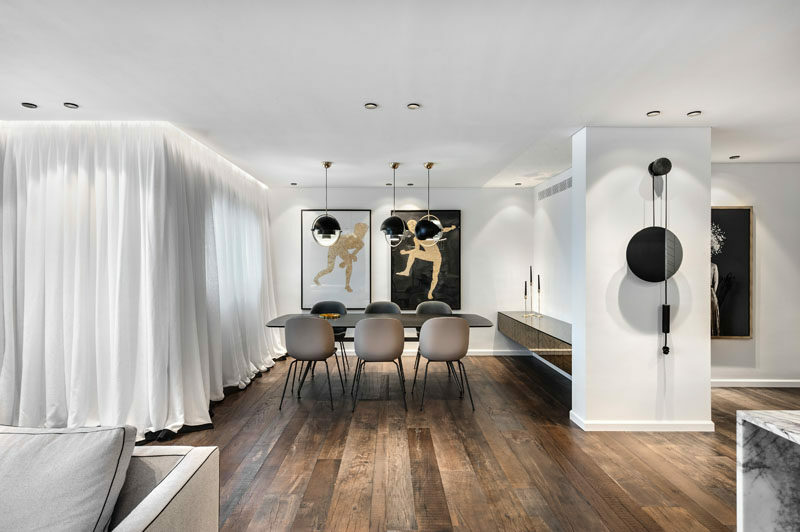 More artwork can be found in the dining room, and white curtains that wrap around one wall of the apartment that has windows, can be closed to create privacy. 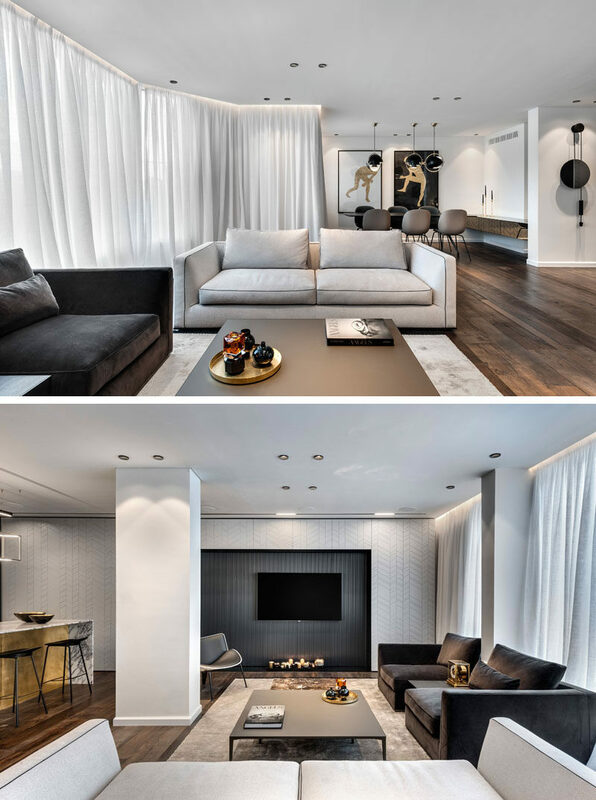 In the living room, the furniture is anchored around a large rug, and on the wall, the television is surrounded by a textured accent wall. Here’s a closer look at the accent wall. 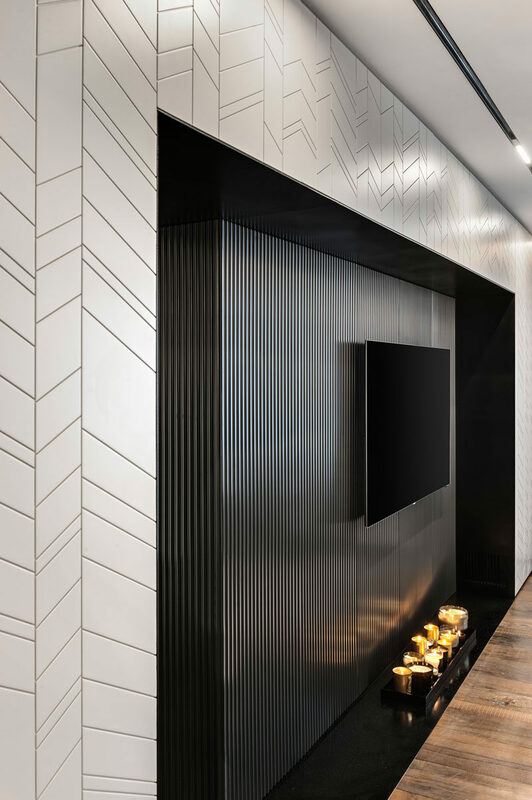 The metallic finish is surrounded by a patterned white wall, that actually has hidden cabinets within. 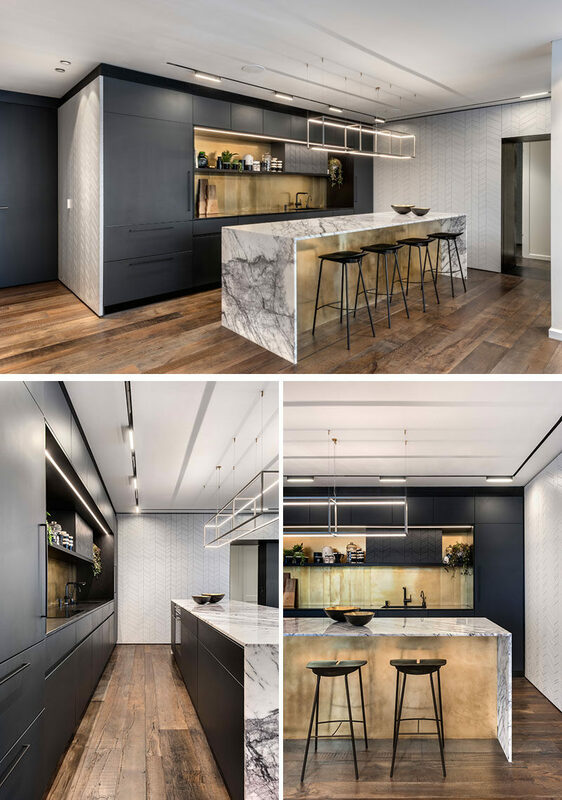 Adjacent to the living room is the kitchen, where matte black cabinets have been combined with a gold metallic backsplash and an island with a marble countertop that wraps down the sides to meet the floor. Beside the kitchen is a door that leads to the more private areas of the apartment, like the bedrooms and bathrooms. In the master bedroom, furnishings have been kept minimal. A walk-in closet is hidden within a decorative accent wall, while on the opposite wall, a bookshelf becomes a place to display personal items. A door off to the side of the bookshelf leads to the ensuite bathroom. 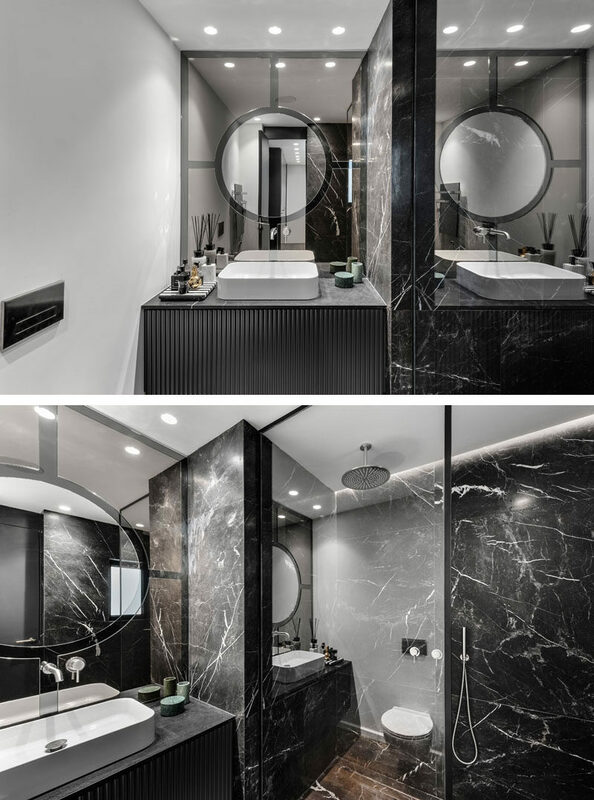 In the master ensuite bathroom, dark elements have been combined with white walls and glass for a luxurious and modern appearance. 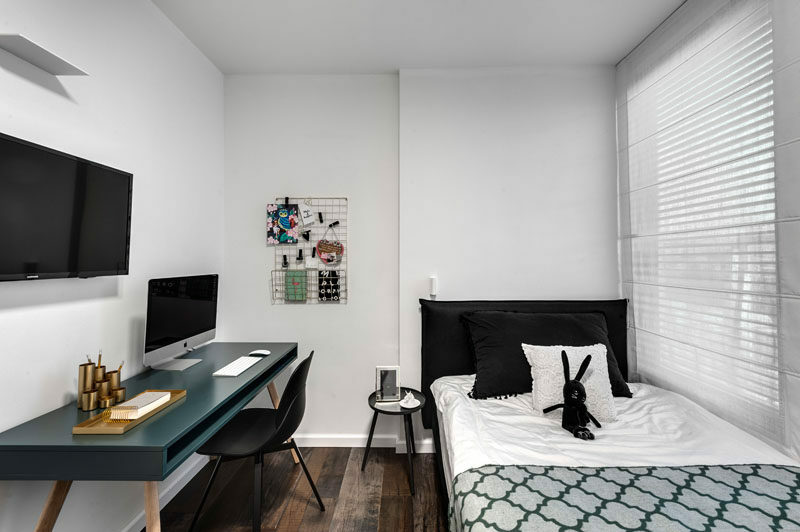 The apartment also has two other smaller bedrooms, like this one below, where a single bed is positioned by the window, and a desk for study is located on the opposite wall. 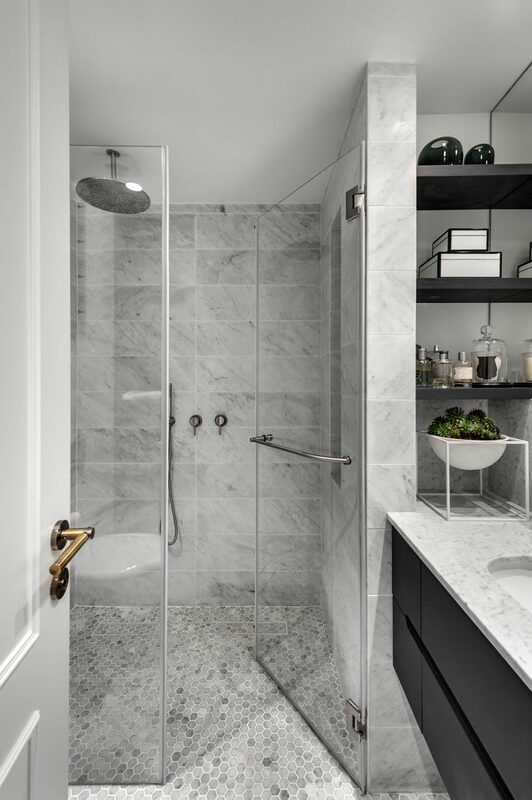 A second bathroom, which is located off the main hallway, has a simple grey, black and white color palette.